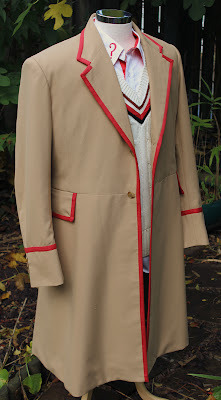 Making My 5th Doctor Costume: Five Coat - Lining, then its DONE! Five Coat - Lining, then its DONE! I have now successfully finished work on the body of the coat, and have nailed the pattern for its visible parts (see right). I now need to sort out the parts hidden from view – the lining. Compared to doing a Tennant Coat, which required its lining to be installed during pretty much the first few stitches, this will be much easier. The pattern for the lining is with little exception a straight repeat of the outer part of the coat, so I won’t go into too much detail about it at this stage. The only panels that are different are the inside fronts, which omit the area covered by the lapels and also have the internal pockets set in them. It is this part of the lining I will focus on here. I have again cribbed the shape of the inside front linings from my charity-bought jacket, cutting it off horizontally at the waist level to match how the Five Coat is constructed (see left, top). The charity jacket had an internal pocket on each side, so I mark and replicate the angle and position for my Five Coat, based on what I have extracted from the dissected jacket. Since I have done several dry-runs at doing the delicate welts in lining fabric, it is now relatively simple for me to do it here. For clarity to myself, and so you can see what is going on, I am using a contrasting colour for the welts compared to the lining (see above, bottom). I am aiming for the welts to be around 10mm high, with the pocket opening a total of 20mm high. I therefore press the folds in the single piece of fabric for the welt 40mm apart. This is sewn to the face of the lining for the width of the pocket opening (see below far left); pinned underneath all this was a patch of calico to act as support around the pocket (see below middle left); I then cut between the lines of stitch, through all layers in the conventional way (see below middle right); and turn the welts through to the back, revealing my final pocket (see below far right). This looks a bit bubbly before it is firmly pressed. 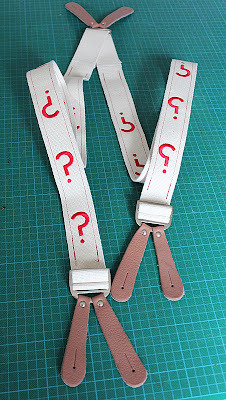 Both the pockets have turned out well, proving it wasn’t a fluke before! I then attach a pocket bag to the back, with some pocket facing to make it look nice when the pocket is used (see below, front and back of finished pocket). These finished panel is then sewn along with the rest of the lining into the coat (see left). 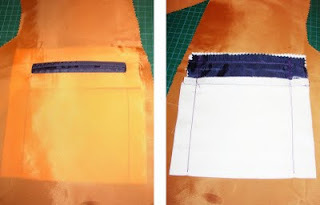 I then hem the bottom of the skirt of the coat, leaving the front sides open for access before top-stitching them closed and enclosing them with the piping which continues down from the lapel (see below). And suddenly it is all done. Phew! Of course, this is just the calico test – now I need to do the real deal . . . 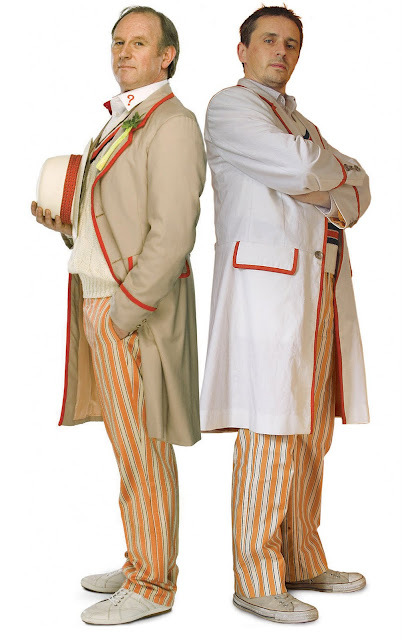 I have to admit looking at the final image on this post with you and Davison, it looks pretty darned spot on. All it all, great work :D.